Sinterklaas (also called Sint Nicolaas) is a traditional Winter holiday figure in Dutch-speaking Europe (Netherlands and Flanders), and is also well known in the former Dutch colonies. 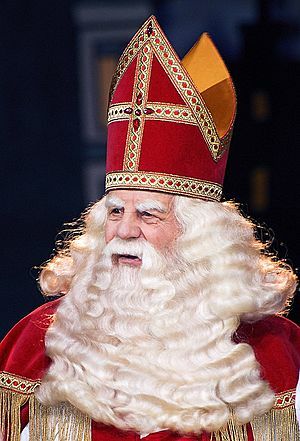 Every year he is celebrated in The Netherlands, one day before Saint Nicholas died (5 December) and on (6 December) in Belgium. His helper and best friend is Black Peter. Sinterklaas is the basis of the mythical holiday figure of Santa Claus in the United States. Sinterklaas has nothing to do with Christmas. Christmas will also be celebrated in the Netherlands. So Santa Claus is not the same as Sinterklaas (in the Netherlands). Sinterklaas on his way from the boat to the City Hall, where he will be officially welcomed by the City Mayor. Sinterklaas Facts for Kids. Kiddle Encyclopedia.